The Sarah Moody Gallery of Art cordially invites you to VERSO | RECTO: Astri Snodgrass Master of Fine Arts Thesis Exhibition, April 9 through May 8, 2015. A reception for the artist will be held Friday, May 1 from 6:00 to 8:00 p.m.
Astri Snodgrass, “sliver,” 2015, Collage on masking tape, 25″ x 18″. Image courtesy of the artist. In fulfillment of The University of Alabama Department of Art and Art History studio graduate program’s terminal degree, Astri Snodgrass presents a body of new work representing her studio research as a painter. She employs various techniques which examine and attempt to expose an anatomy of painting. Snodgrass says, “Everything I am making has my sensibility of painting: thinking about movement and light; allowing things to happen.” Her experimental approach for this exhibition – using painting, photography, and image projection – provides insight for the viewer as well. Snodgrass completed her undergraduate education at Luther College, Decorah, Iowa, in Spanish and Studio Art. She has studied at Universidad Nacional de Cuyo, Universidad de Congreso, Mendoza, Argentina and at Nansenskolen Norsk Humanistisk Akademi, Lillehammer, Norway. 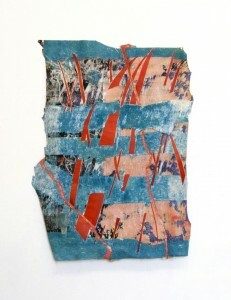 Her work has been included in numerous group and solo exhibitions. She is a member of Phi Beta Kappa National Honor Society and Sigma Delta Pi National Collegiate Hispanic Honor Society. There will be a public reception for the artist May 1, 2015, 6:00 – 8:00 p.m. Admission to the gallery is free. Funding support for the Sarah Moody Gallery of Art comes from the Department of Art and Art History and the College of Arts and Sciences. Gallery hours are Monday through Friday 9:00 – 4:30 p.m., Thursday evenings: 5:00 – 8:00 p.m. The gallery is located at 103 Garland Hall in the heart of the UA campus on Woods Quad. Information about visitor parking is available here: http://bamaparking.ua.edu/visitor-information/. Parking is free on campus in a legal space after business hours. Image credit: Astri Snodgrass, “sliver,” 2015, 25 x 18 inches, collage on masking tape. Image courtesy of the artist. For more information, contact Vicki Rial, Exhibitions Coordinator, Sarah Moody Gallery of Art | 205/348-1891 | vicki@ua.edu or go to the website: http://art.ua.edu/gallery/smga/.